I was asked the other day to, in just 5 seconds, name the first movie that pops on my mind, which fulfils the criteria of both simplicity and effectiveness at the same time. And let me tell you, for someone who takes the art of moving pictures very seriously, this was one of the toughest jobs I had to do (at least in this area). And disco! While my head spins around like a wheel in those 5 seconds, not 1 but 3 titles came out, with “Smoke” being one of them. A Silver Bear winner at the 45th Berlin International Film Festival, Wayne Wang’s and Paul Auster’s independent project directed back in 1995, “Smoke” is a mish-mash of several stories that surround different characters, with a central stage in a tobacco/magazine store in Brooklyn NY. 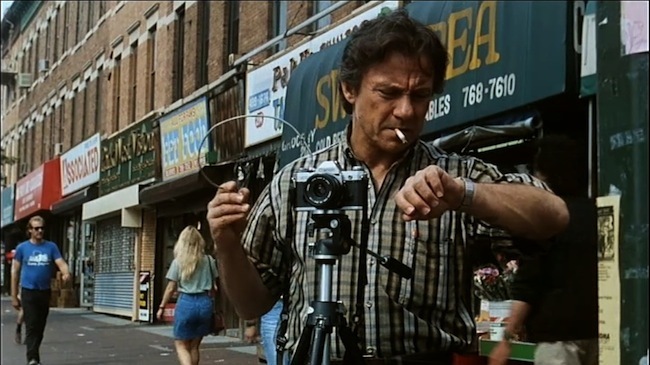 Slow-paced Auggie (played brilliantly by Harvey Keitel), the store’s owner, is the central figure of the movie. Or is he? Let’s play this game fair and say that “Smoke” wouldn’t be so influential and “full” in its own way if it didn’t have the rest of the crew – besides Auggie, we are in the presence of once famous writer, Paul (played by William Hurt), an auto-mechanic Cyrus (Forest Whitaker), Ruby (Stockard Channing) and Thomas (Harold Perrineau), among others. “Smoke” may have the central stage, but it doesn’t have a central story, which additionally puts this film into the “must” basket. 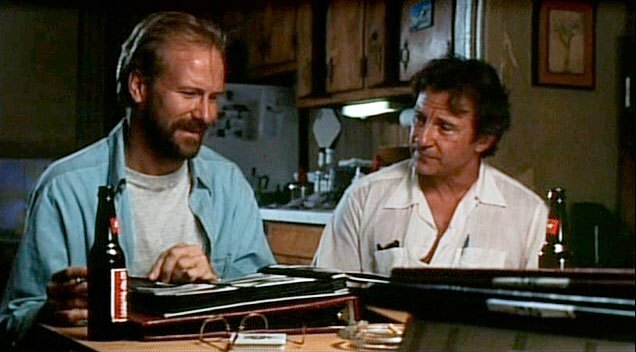 Several film writers, back then and even nowadays, tend to focus this film on one rather peculiar and interesting part of it – the fact that Auggie takes a picture of the same frame every day at the same time with his Canon AE-1. However, I don’t believe that this is the case. “Smoke” is not about a tobacco shop, a camera, or about one particular person whose store is his whole world, it’s that mixture of people’s feelings, random events, and small peculiar details that makes this film so real. It’s about Paul’s failures, Ruby’s bad judgments, Cyrus’ pain or Thomas’ lies. “Smoke” is about everything and yet about nothing. Yes, the film’s resemblance with some of the Spike Lee’s projects is naturally inevitable. From the way the characters move, communicate and feel, to the fact that the plot might not build up the way you thought. Actually, one person told me that “if it wasn’t for the soundtrack I’d definitely think that it’s a Spike Lee’s movie”. In the end everything fits, doesn’t it? Well, if not, at least we have probably the best Christmas story ever spoken in ten minutes. Whatever you feel about this 1995 project, you have to admit that it does prove how something so ordinary can be so effective. And I will dare to say, it’s a lesson for nowadays filmmakers. Maybe the simplicity is dead. Maybe those easy-going meaningful plots that make you think and rethink over and over again are matter of history. But I am sure that it remains to be seen weather stories like these will always remind us how that simplicity is more than just a pure coincidence. Isn’t it? Reblogged this on Lifestyle Mish-Mash. One of my favourite modern American films. The cast is superb, the timing flawless, and the script is sharp and sparing. My only negative point about your review, is that I do love the once a day photography moments (no pun intended…), and the relevance that they inject. Perhaps because I like photography, but more because it lends something extra to the film. A modern classic, with some disparate characters, some marvellous cameos, and a solid central performance from Keitel, that holds all the strings together. Let’s not forget the sequel, ‘Blue in the face’, which carries on the fun, and provides a few conclusions. Great review, and equally enjoyable to see it featured on WOF. So, thanks very much. Pete.